One thing I noticed in sales was that it was so easy to end the week exhausted, feeling that I did so much work only to fall short of hitting my targets for meetings scheduled or completed, or prospecting calls made. As the week progressed, it was filled with more emails than anticipated, overlong meetings with prospects, ad hoc chats with teammates ... and bam! – I was off track, not hitting weekly action goals. I hated that feeling. I felt, “I need a miracle now.” The sheer fear of not making quota (read: not getting commission) and unplanned hit-or-miss actions produced a week that I felt was uncharacteristic of me – and certainly unproductive. Funny thing is: I wasn’t a rookie anymore. I knew that rhythm and pace were more important than individual purchases. But it was still tough to keep my own thing going, the world just swallowed me and I felt like a victim. Eventually, I learned from a seasoned salesman that you should have no “free” space in your weekly calendar as you plan it. Even if a meeting with a prospect is yet to be proposed, the times when this could happen should be booked in your calendar. The same with every other important key action (calls to prospects, writing up proposals, answering emails). Let’s say you have a goal of 10 demo meetings a week (two per day), and 100 prospecting calls a week (20 per day). The first thing you achieve with block logic is that everything feels doable, and your commitments constitute a more realistic plan. It happens as you break goals down to the day and hour level. Second, it’s important to realize it’s a commitment for you and only you to keep. So, you need discipline to keep the rhythm as you execute, and it all starts with a decision to follow your plan. But just seeing your week packed with key actions gives enough sense of urgency as you plan, or go through your day. Third, it takes some time to know your preferences, and whether it works well enough for prospects and customers. When should you plan which actions? Should you plan to call prospects in bulk in your morning hours, or afternoon? Should you answer emails first thing, or later? Should you meet prospects and customers one after another, or have one meeting in the morning, and another in the afternoon? It makes sense to play around, and see what works best. I learned that I wanted half an hour but not more in the morning for emails (to see most urgent responses), and I left the remaining emails for late afternoon. I noticed that I was at my best with prospecting calls from 4 to 6 p.m. I tried other times, but this one always worked out best. Whenever I placed calls like these, I was much better at doing 20 in row, rather than 10 in the morning, and 10 in the afternoon. I saw that having back-to-back meetings was better for me, first from a travel perspective, and I just liked how something good from the first meeting carried over to the second. The beauty with the block method was that everything important got placed into my calendar BEFORE other important things from the outside world wanted to land there. I was able to look at these entrants with a much better sense of urgency and balance. Another crucial point is realizing that execution of the weekly plan – and planning your moves next week should happen at the same time. If you want to hit your activity targets, you have planning goals and execution goals. For example, you need to execute your 10 demo meetings and 100 prospecting calls during the current week, and schedule the same number of meetings and prepare the call lists for next week. It’s not enough to hit an execution goal – you need to hit the planning goal, too, and keep your future calendar in front of you all the time. Prepare the call lists, make prospecting calls, schedule demo meetings – they all feed each other, and are required to get closer to the results you’re after. Failing to hit the planning goal kills your chances of hitting the execution goal next week. So, as far as meetings go, following the earlier example – it’s a good day when you’ve held two meetings, and scheduled two meetings for next week. Here’s an example to illustrate why you need to set and keep planning goals along with execution goals. I used to consult a law firm on their sales. When we started off, every partner had a goal of booking five meetings for next week – it was incredibly successful, and they started seeing growth from the get-go. After two months, however, the company made a small change in how they defined the goal. Instead of counting the meetings they booked for next week – they started counting the number of meetings they had held each week. This led to a sudden drop in actual meetings, as the planning goal was removed and replaced with an execution goal – which of course can’t be realized if you don’t plan ahead. If you’ve missed your target, you need to correct it. It’s there for a reason, and the reason is your overall success, you hitting your quota and earning commission. If you have a correcting mindset, you will start finding ways of hitting your numbers even if you missed a goal one day. The solution is pretty simple – you need to be stubborn, adjust, and work hard to achieve your activity goal no matter what. A final aspect about setting planning goals and achieving them? Success breeds success, and it simply feels really good to tell a prospect “the only time I can meet is next Thursday at 4.” It’s a sign that you’ve filled your calendar well. If you’re in a situation where your sales cycle requires you to hold multiple meetings before the close, you risk falling into the trap of counting the wrong meetings as your success indicators. For instance, if you have an average of three meetings per deal before the close, you need to have all of them, of course, but count only the first ones. The best way to overcome this trap? Make a rule for first activity per deal blocks. You have a block for first prospecting calls (cold or warm) instead of all calls, and another block for first meetings instead of all meetings. 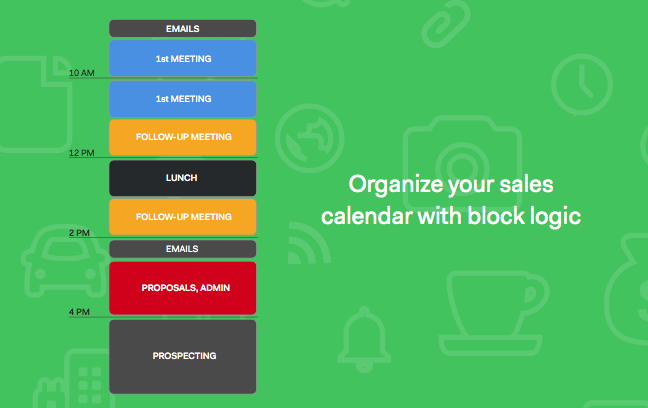 You should still block the time in your calendar for your second and third meetings. This ensures that you don’t inflate your goals and achievements in a way that fails to reflect the reality. More importantly, it ensures you don’t lose focus from the actions that feed your business. Money in the bank and the bonus line on your paycheck are your tangible rewards. Being on schedule is the biggest reward you can have until then. And it’s the only thing that will lead you to your sales goal (and that fat paycheck). So, learn to reward yourself based on this, at least mentally and emotionally. You know your personal productivity schedule better than anyone else. Only you know the road to good results. It’s a job you can’t delegate. Once someone else starts guiding when and where you need to be productive and sharp, you start losing rhythm and productivity. For example, your day is scheduled to consist of two hours of cold calling in the morning, an hour of proposal writing, two hours of lunchtime meetings, and another two hours of cold calling in the evenings – and then suddenly a potential customer proposes to meet the first thing in the morning – you’re going to miss half of your calls. This will mean fewer prospects in your pipeline, fewer meetings that follow after and fewer closed deals. It’s tough to turn a request like this down when you’re desperate and off track, but when you’re in rhythm and on track, you’ll negotiate a better time, doing what needs to be done for the day to get results.